Astonishing debut from a promising new band from Glasgow, Scotland where everyone is in a pop band—it's in the blood, it's in the water and it's in the contract. Sandra and Laz have built a feedback wall of sunshine sound out of old fuzz boxes and reverbed drums that recalls some of the best C-86 pop from The Shop Assistants, Talulah Gosh, The Primitives, or The Revolving Paint Dream. The debut single includes the infectious lead track ‘Who’s In Your Dreams?’ which is creating quite the buzz on international indie blogs already. It’s a hip shaking pop gem with tambourines, splendid melodies, loads of reverb and just the recommended dosage of ba-da-ba's. ‘It Rains On Other Planets’ is a shimmering wall of sound with noisy guitars, steady drumming, piercing organ and handclaps, while ‘My Day Today’ is an immediate 150 bpm pop hit with jangling guitars and keyboards that in a parallel universe would fill dancefloors to capacity. Final track ‘Factory Girl’ is a harmonic wall of pop based around the Warhol Superstar phenomenon—think Mary Chain meets The Primitives and you’re nearly there. 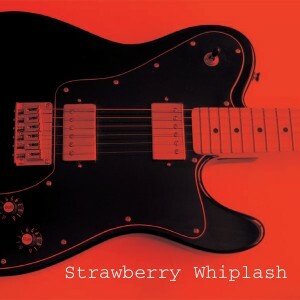 An especially invigorating addition to the Matinée catalog, Strawberry Whiplash are early contenders for favorite new band of 2008! Limited to 1000 copies in custom minijacket sleeve. Hazy, dreamlike vocals are backed by a wall of static guitars in this up-lifiting and joyous release from Glasgow’s Strawberry Whiplash. Sandra, Laz, Paul and Duncun all pay fitting tribute to 80s shoe gazer bands such as Jesus And Mary Chain and indie pop acts like St Etienne- with gorgeously fuzzy results. It’s an EP which is easy to love with its hand claps, synths and simple harmonies all forming winding round echoing, reverberating guitars in these hip shaking gems, whilst the simple, almost childlike ‘My Day Today’ is pure pop perfection. Lovely stuff! --Is This Music?